THE BLOOMSBURY CLUB The very first YMCA in the world, this exceptionally impressive Grade II building is now an elegant hotel. It has a 1920s-inspired Coral Room bar, a wood-lined, tony hipster lounge for cocktails in the lower level (where we've done several corporate score tallying), a lovely verdant terrace to serve high tea (the Dalloway Terrace, where we've done customised hen hunt prize giving). Any of their settings hits it just right, but it’s pricy. Not a surprise, as it's to the standard of the Doyle Collection. The old RUSSELL HOTEL has a new incarnation! For hipster clients, the 5-star Kimpton Fitzroy Hotel on Russell Square recently finished its renovation of the Grade II 1898 The-au-Lait building, with superflash bars, cafes, restaurants and spaces for treasure hunt score tallying! They have an appropriately splendid cocktail bar, Fitz's (named for the building's architect Charles Fitzroy Doll), a Burr & Co coffee bar with a large communal table that can seat up to a 25 people hunt or the upmarket seafood restaurant, Neptune. 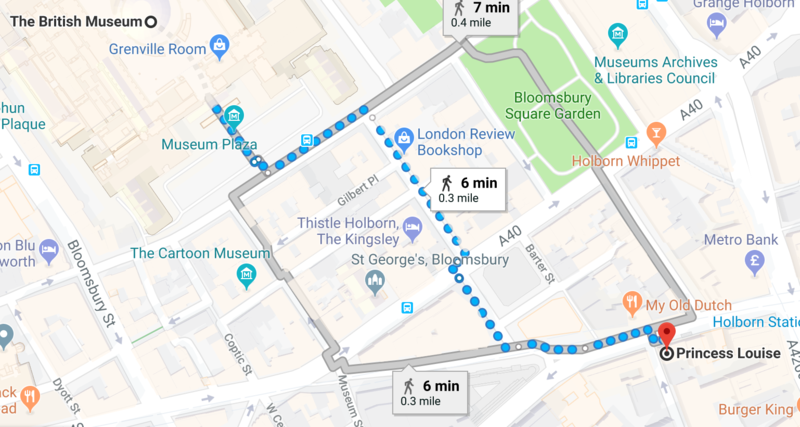 Directions: We'll exit the back of the British Museum & wander across Russell Square & we're there! 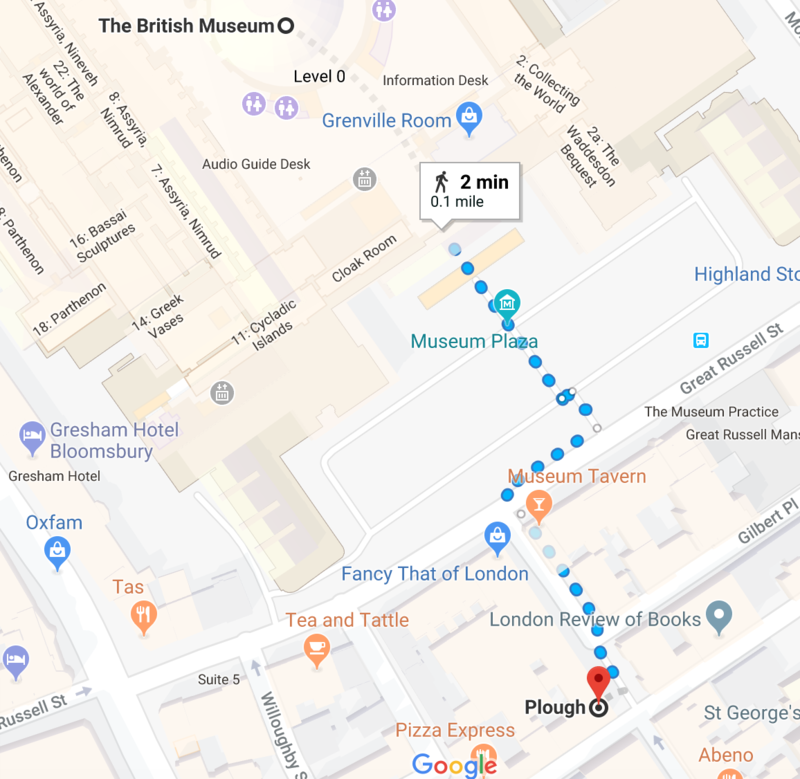 Directions: When exiting the museum's front entrance on Great Russel Street, turn left onto Bury Place. 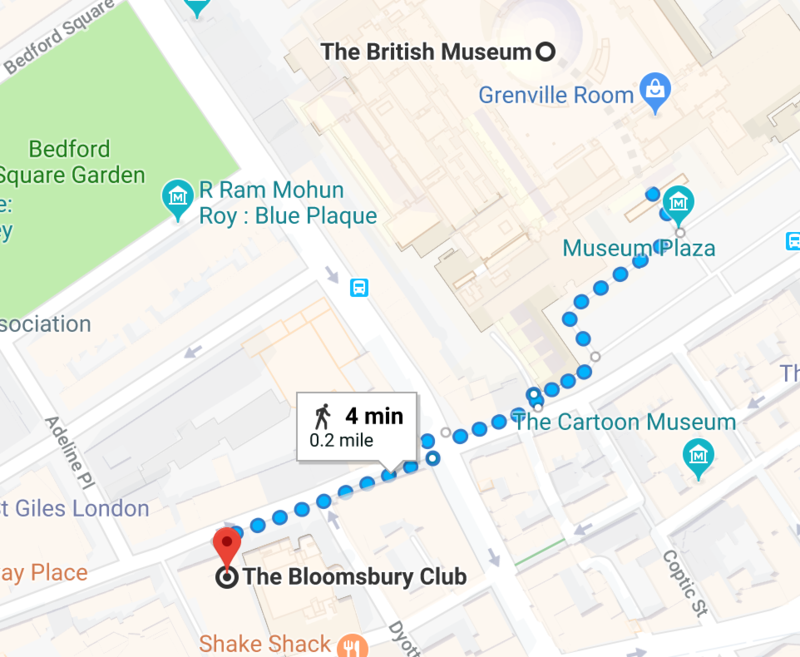 Next, turn right onto Bloomsbury Way. Cross the street and make your way back onto Bury Place. Turn left onto New Oxford Street, continuing onto High Holborn till you reach the Princess Louise. This walk should take about 6 minutes. Conveniently located just opposite the BM, who doesn't like going through a bookshop to get to your cakes? As their website says: “Surrounded by books and fragrant with tea, the London Review Cake Shop is the modern answer to London’s long-lost literary coffee-houses” It’s a small space only good for small hunts, with a communal table that seats 16 near a green courtyard and about 8 tables seating another 16 along a banquette. Delicious heavy cakes, wide variety of teas. Plus it feels right to support small independent bookshops! We've hosted plenty of Luxe Travelling families on their score tallying here.